View of 'Peterhoff' at Simla. bl.uk > Online Gallery Home	> Online exhibitions	> Asia, Pacific and Africa Collections	> View of 'Peterhoff' at Simla. 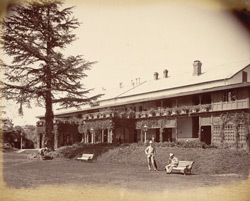 Photograph of the Viceroy's Residence at Simla (Shimla) in Himachal Pradesh from the Gladstone Collection, taken by an unknown photographer in the 1880s. Simla (the present-day capital of Himachal Pradesh) was the largest of the Indian hill-stations and derives its name from the mountain goddess Shyamla Devi. Discovered by the British in 1819 after it had been recovered from the Gurkhas of Nepal, its temperate climate and spectacular scenery made it popular with British residents of India by the 1820s. It even became the summer capital when the Governor General began to take his council there to escape the intense heat of Calcutta 1,300 miles away. Foreign travellers called Simla the 'English Convalescent Station'. The Governor General originally rented Peterhof (destroyed in 1981), a tin-roofed, two-storey chalet with five bedrooms, until a fine Viceregal Lodge was built in 1888. This is a general view of the house with two European men on the lawn in the foreground.